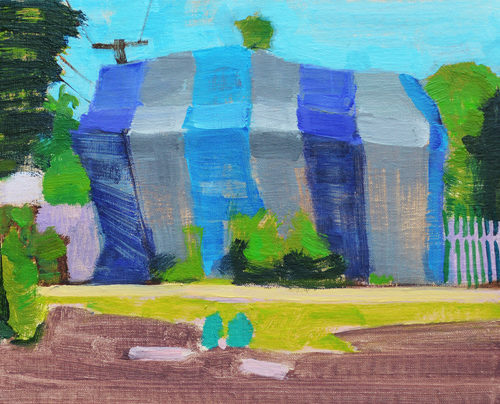 Before moving to San Diego, I don’t think I’d seen any buildings in fumigation tents. 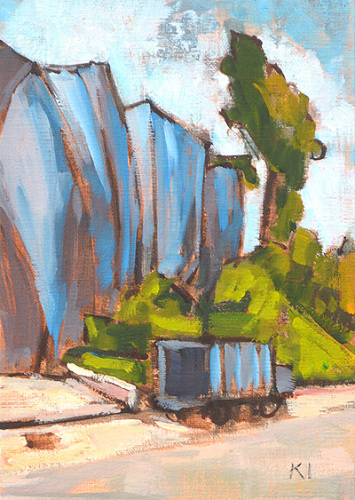 Like trolley and telephone wires crossing the sky, dumpsters in alleys, and trash cans lined up like soldiers for inspection, I think they add a really exciting decorative element to the urban landscape. 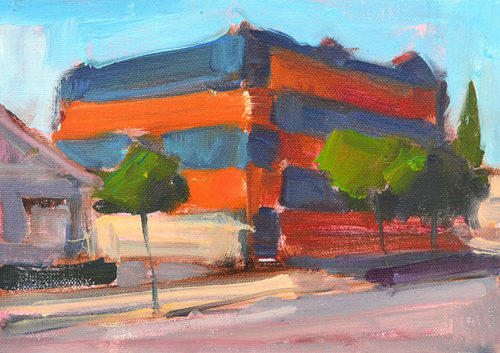 This entry was posted in Landscape Paintings, San Diego Paintings, Urban Landscapes and tagged 5 x 7 inches, california, oil on linen on panel, san diego, termite tent on August 30, 2015 by Kevin. 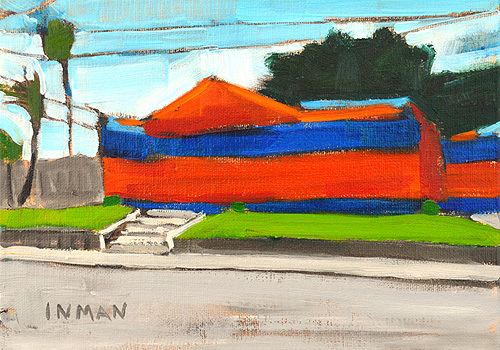 Part of the Days Motel when it was tented last week. 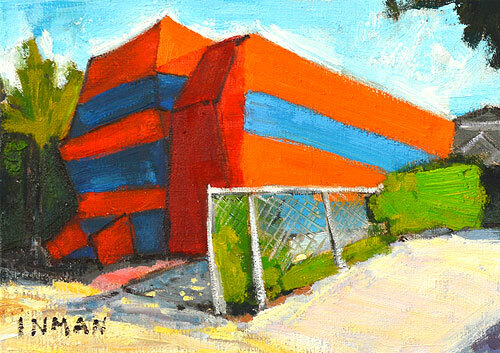 This entry was posted in Landscape Paintings, San Diego Paintings, Urban Landscapes and tagged 5 x 7 inches, california, landscape painting, motel, oil on linen on panel, san diego, termite tent on December 23, 2014 by Kevin. 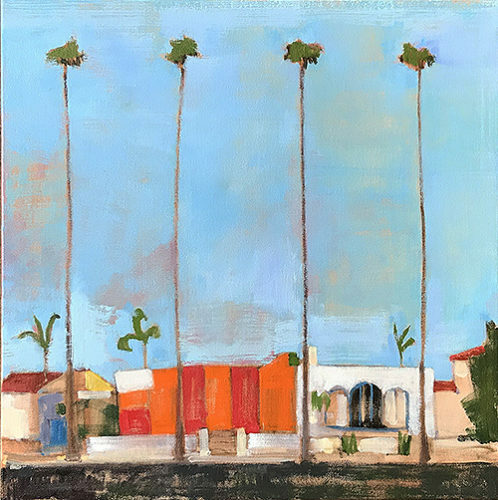 This entry was posted in Landscape Paintings, San Diego Paintings, Urban Landscapes and tagged 7 x 5 inches, california, oil on linen on panel, san diego, termite tent on October 29, 2014 by Kevin. 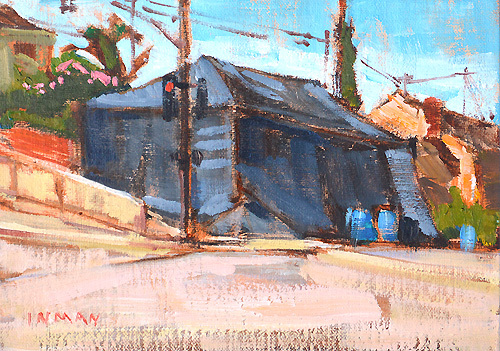 This entry was posted in Landscape Paintings, San Diego Paintings, Urban Landscapes and tagged 5 x 7 inches, california, oil on linen on panel, san diego, termite tent on October 21, 2014 by Kevin. 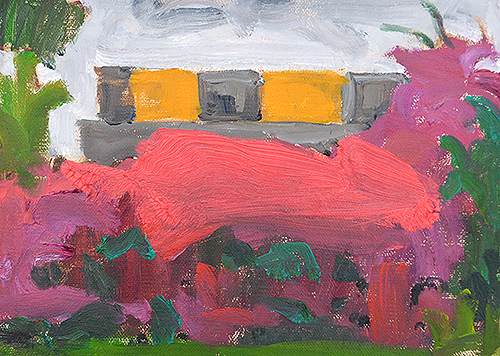 This older painting is still one of my favorites. 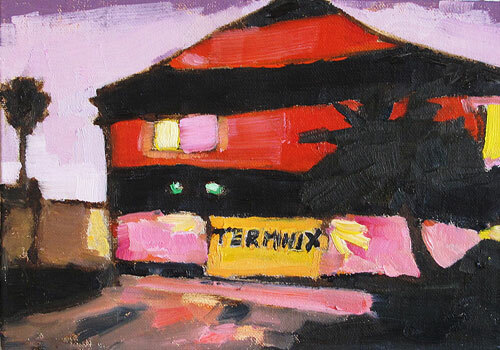 What I love about it is the way the building glows inside the termite tent- they left on the floodlights and in some of the apartments. (I thought you were supposed to cut off the power before tenting, but I’m no expert). And it always takes me back to that cool, wet-smelling night with a marine layer overhead. 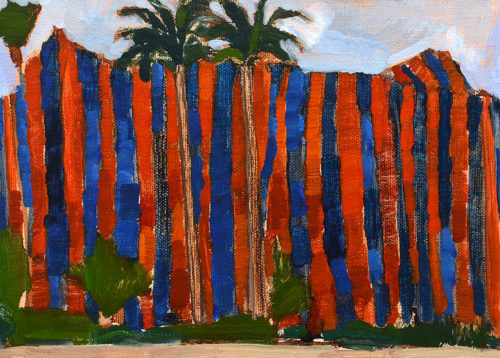 Here’s a link to the rest of this series of termite tent paintings. 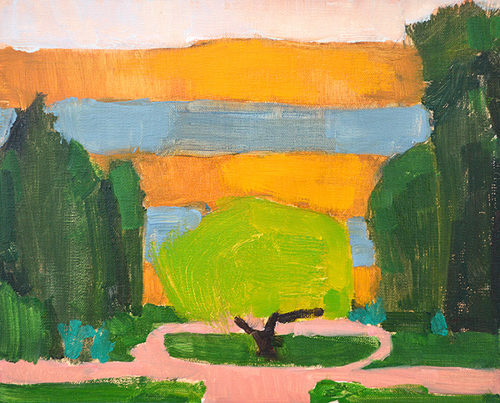 It’s a subject that always draws me back. 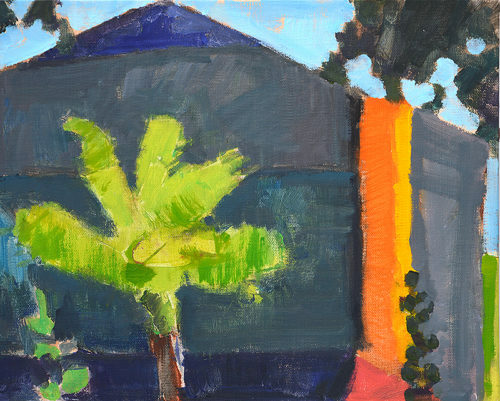 This entry was posted in Landscape Paintings, San Diego Paintings and tagged 5 x 7 inches, california, night painting, nocturne, oil on linen on panel, san diego, termite tent on May 31, 2014 by Kevin. 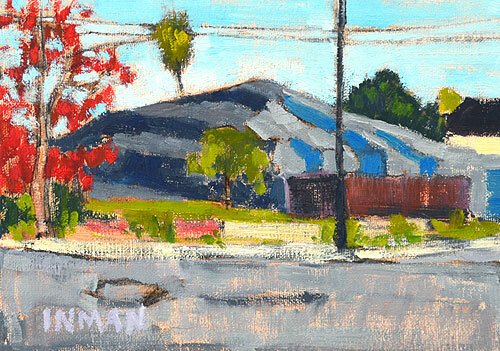 This entry was posted in Landscape Paintings, San Diego Paintings, Urban Landscapes and tagged 5 x 7 inches, california, city, landscape, oil on linen on panel, san diego, termite tent, urban on January 31, 2014 by Kevin. 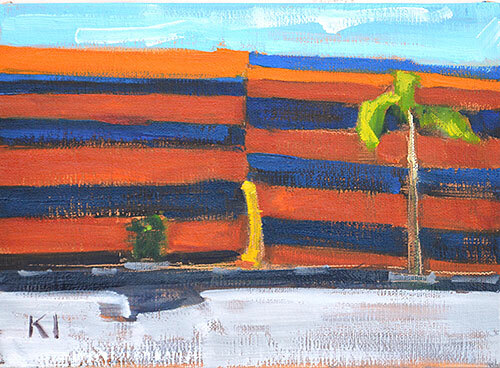 This entry was posted in Landscape Paintings, San Diego Paintings, Urban Landscapes and tagged 5 x 7 inches, california, city, cityscape, landscape, north park, oil on linen on panel, palm tree, san diego, street, streetscape, stripes, tented building, termite tent, urban on January 29, 2014 by Kevin. 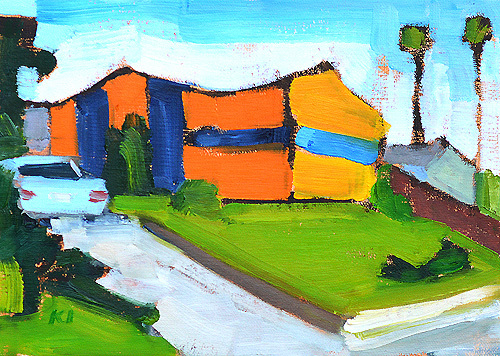 This entry was posted in Landscape Paintings, San Diego Paintings, Urban Landscapes and tagged 5 x 7 inches, california, house, landscape, north park, oil on linen on panel, orange black, palm tree, san diego, termite tent, urban on January 6, 2014 by Kevin.